However there are 2 scenarios, you could use BGDatabase in multi-threaded environment (for example, with Unity ECS). Use data from BGDatabase and create Unity ECS entities. Merge changes back to database on save if needed. If you need some of these Unity ECS entities to be persistent, (e.g. they needs to be saved/loaded), store them back to database the moment they needs to be persisted, e.g, when the game needs to be saved. Run saving/loading on main thread. If you need to call database from multithreaded environment, use BGMainThreadRunner.RunOnMainThread(Action action). This will add action to the jobs list to be run on main thread. Make sure you call at sparingly, at some relatively rare condition, otherwise it can become a bottleneck. Use multi-threading addon (MT addon). 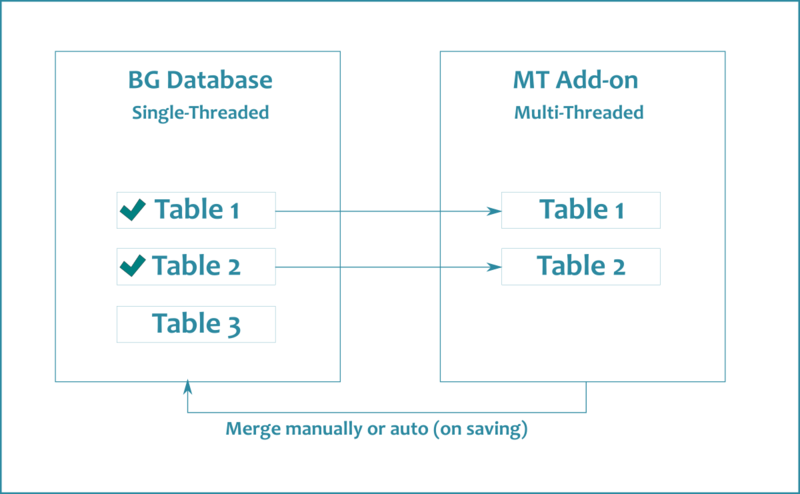 Multi-threading addon creates environment, which can be accessed from multiple threads safely, by coping chosen tables data into special data containers. You can chose which tables you want to be accessible for multi-threading operations. You can merge changes back to main database either manually or auto (on saving). Otherwise changes are not synchronized. Merging changes back is pretty expensive operation. MT addon has it's own code generator and API very similar to single-threaded API. There are 2 types of transactions: lightweight, lock-free readonly transactions and very heavy write transactions. If you need to update data very often, please, consider scenario # 1 instead. Lists fields, Unity assets fields and fields, which reference Unity objects are not supported. We tried our best to make multithreaded API very similar to single-threaded one. Also, we provide code generation for MT addon. Start working with multithreading environment by creating read-only or write transactions. // you can read and change data here.